MANILA, July 25 (PNA) -- President Rodrigo Duterte on Tuesday announced that the families of soldiers and policemen who died fighting Islamic State-inspired militants in Marawi City will each receive PHP1 million from an anonymous donor. The President made the announcement during the turnover of financial assistance from the Go Negosyo Kapatid Family Fund and the Federation of Filipino-Chinese Chamber of Commerce and Industry Inc. (FFCCCII). “There is a one single soul dito na sobra-sobra ‘yung magnanimity niya. Ayaw kong sabihin kasi ayaw rin niyang sabihin. Ayaw niyang sabihin ko sa publiko o kanino man,” the President said. “Sabi niya, ‘Huwag lang malaman,bBasta ako magbigay.’ Bigay siya ng one million para sa inyo isa’t isang pamilya. I can see the soul of the man. Ito ‘yung pupunta talaga sa langit,” Duterte said. His announcement drew loud applause from members of the bereaved families of 101 slain security forces as well as from the benefactors and other government officials who were invited in the event. Besides the PHP 1 million from the anonymous donor, each of the bereaved families also received more than PHP 200,000 from the Go Negosyo Kapatid for Marawi and the FFCCCII. Some of the country’s top tycoons, among them First Pacific Company CEO Manny V. Pangilinan, LT Group CEO Lucio Tan, and SM Investments Corp. Vice Chair Teresita Sy-Coson, were present at the event. According to the Go Negosyo Kapatid, the event's host, the Kapatids have also gone the extra mile by providing travel and accommodations to the families who traveled to Manila for the event. The Tan family (Philippine Airlines) has given free airfare to fly in all the families while Injap Sia (Double Dragon Properties) and Tony Tan-Caktiong (Jolibee Food Corp. & Double Dragon Properties) gave the families free accommodations at Hotel 101 and free meals through Mang Inasal and Jollibee. Go Negosyo Founder and Presidential Adviser for Entrepreneurship Joey Concepcion said the Palace event aims to show the unwavering commitment of the private sector to inclusivity and peace and its genuine gratitude to the heroes through helping their families get through these tragic times. “The events that have transpired in Marawi over the past weeks are truly heartbreaking. Many of our brave soldiers have laid down their lives in order to bring safety and peace amidst the violence and struggle,” he said. 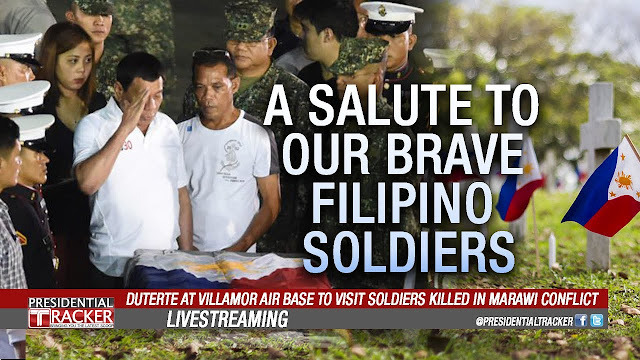 “Through this occasion, we want to honor these courageous souls by showing that their fellow countrymen—from the government to the business sector—have not forgotten about their ultimate sacrifice and their loved ones who miss them dearly,” Concepcion said. In the meantime, President Duterte expressed the government’s deep gratitude to the Filipino businessmen for their generous donations of cash and other assistance to the Marawi cause. “I would like to commend our partners from the private sector for their participation in the rehabilitation of the city of Marawi. Your humanitarian activities are continuous sources of hope for the thousands of displaced families in the region,” he said. “Thank you for extending the much-needed support for the bereaved families of our fallen AFP and PNP troops,” the President said. “To the Go Negosyo Kapatid Family Care Fund under the Go Negosyo Kapatid for Marawi Program, your tireless efforts show that nothing is impossible as long as we work together. I hope that we can continue this harmonious partnership to bring back prosperity, not only for Marawi but for the rest of the country,” Duterte said. According to a press statement issued by Go Negosyo Kapatids, members such as the FFCCCII, DU30 Cabinet Spouses Association, Tessie Sy-Coson (BDO, SM Group), Josephine Gotianun Yap (Filinvest), Jaime Zobel de Ayala (Ayala Corporation), Manny Pangilinan (PLDT SMART Foundation), Alfred Ty (Metrobank Foundation), Jean Henri Lhuillier (Cebuana Lhuillier), Mildred Vitangcol (St. Peter's Chapel), Alice Eduardo (Sta. Elena Corporation), Federico Lopez (First Philippine Holdings), Michael Tan (Asia Brewery & Philippine Airlines), Tony Tan Caktiong (Jollibee Foods Corporation), Injap Sia (Double Dragon Properties), Joey Concepcion (RFM Corporation), Jojo Concepcion (Concepcion Industries), William Belo (Wilcon Depot), Dennis Uy (Chelsea Logistics), Santi Araneta (LBC), and Sabin Aboitiz (Aboitiz Corporation) as well as many other have shown their genuine concern and support through their generous donations to the Marawi fund for grieving military families. The statement said that since the onset of the Marawi conflict, the Go Negosyo Kapatid network has pooled together its resources and efforts in order to bring support and relief to the soldiers in Marawi. The community has been able to send out more than 5000 care packages which included food, water and personal care items to the displaced Maranaos and to the troops on the ground.